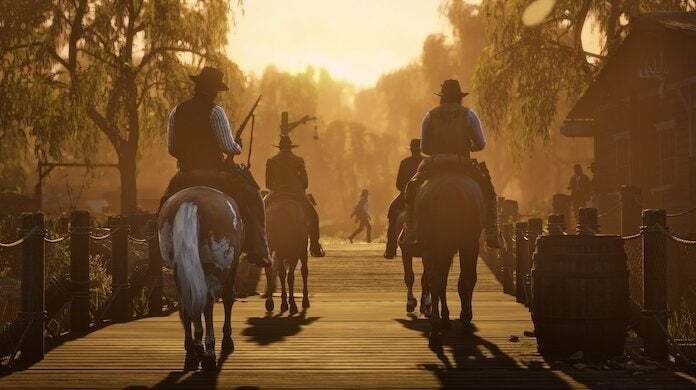 Today, Rockstar Games revealed that the next big update coming to Red Dead Online will arrive sometime later this spring. In addition to providing a release window for said update, Rockstar also detailed the changes and upgrades that the update will come packing, which includes a new hostility system, new ways to play, new classic weapons, new missions, and more. "With each passing week we continue to add more to the Red Dead Online Beta, and the next four weeks will bring new Showdown Modes and Racing Modes, as well as a new Free Roam Event that launched earlier today," writes Rockstar Games in a new blogpost. "Alongside incorporating player feedback and addressing existing issues, the beta period has allowed us to lay the groundwork for the more advanced aspects of Red Dead Online still to come. Our experience of building other online worlds has helped us create a more evolved foundation for the open spaces of Red Dead Online, but the world of Red Dead Online will evolve in its own unique direction - one in which players have greater freedom to customize their play style uniquely over time, allowing them to sink into the world and their character and feel more connected to the experience of living as cowboys, outlaws and gunslingers in the wilds of 19th century America." So, all of that said, what's new? Well, for one there's a new hostility system coming that builds upon the anti-griefing measures the last major update added with "smarter and responsive features that keep players immersed in the world through confrontations and PvP action." Fixing what the last update did, players will be able to defend themselves without incurring Bounties or Hostility. Previously, the attacker and target were both marked as enemies, but now only the attacker who first inflicts damage will be marked as an enemy, and when you kill a player marked, you won't accumulate Hostility. Hostility increases will also not apply within structured events, like Free Roam Events and Races. "Engaging in player vs player behaviors related to Free Roam missions will not incur Hostility increases, however attacking other players not engaged in the activity will cause your Hostility level to rise," writes Rockstar. The update will also add new offensive and defensive playing styles. The former is basically what current Free Roam is, while the latter is a new, more evolved version of the Passive mode concept, designed for a more grounded experience and the players who just want to explore, hunt, and fish in peace. Defensive playing style will give players more flexibility in how they interact with the world, and decrease hostile contact with other players. "Choosing the Defensive option introduces balances that compliment a less confrontational approach: Defensive players cannot be lassoed by rival players - although if a Defensive player lassos another player, they’ll be removed from Defensive play and incur a significant Hostility level increase," writes Rockstar Games. "Defensive players will trade the ability to lock on to other players for the benefit that other players will not be able to lock on to Defensive players. "While Defensive players can target and be targeted in free aim, they cannot deliver or receive critical hits – if a Defensive player is attacked with a headshot, they’ll survive and be able to defend themselves via the Hostility system or escape all while remaining Defensive. There are several other adjustments that come with the Defensive Playing Style, all of which are built to work seamlessly with systems like Hostility and Bounties to keep all players rooted in the world." In addition to these two new features, the update will also include more A Land of Opportunities Missions as you continue Jessica LeClerk's search for revenge and explore the path of a gunslinger or an outlaw. There will also be new Free Roam mission givers and types, and the introduction of dynamic events, like ambushes and defending towns folk. Rockstar Games also outlines character creator changes, restructured Daily Challenges that eliminate hostile gameplay in Freedom and introduce streaks for bigger rewards, the return of another classic weapon, the LeMat Revolver coming back, and more. "In the coming months, we will continue to add features and content that will allow players to immerse themselves in the world of Red Dead Online in brand new ways as they choose what kind of life they will make for themselves in frontier America." Red Dead Online is available to play on PS4 and Xbox One.